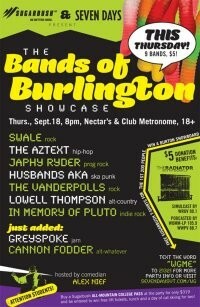 Bands of Burlington — Tonight! Come to Nectar's tonight for an 18+ explosion of local music mayhem! Nine bands will play on two floors to benefit The Radiator. Sugarbush will be giving away T-shirts and season passes. You could also win a complete 2009 Burton Snowboard package or an "All You Need is Love" spa retreat from Cynthea's Spa. All the gooey details are here. See you tonight! Why do I always watch the Republican convention? Working at Seven Days Vermont since 1998.